Record-setting trainer Todd Pletcher picked a great time to win his first race at Kentucky Downs since 2010 as Calumet Farm's Channel Cat outfought the late-running Cullum Road to win the $400,000 Exacta Systems Dueling Grounds Derby by a head on Wednesday's penultimate card of America's most unique race meet. Winning the $300,000 Fifth Third Insurance Dueling Grounds Oaks was front-running Osare, trained by Pletcher's former assistant Jonathan Thomas. Wagering from all sources totaled $7,329,490 on the 10-race card rescheduled from Sunday because of torrential rain. Until running four horses this meet, trainer Todd Pletcher hadn't run a horse at Kentucky Downs since 2014 and hadn't won a race since 2010. “Is that all it's been?” Pletcher joked when told he won his first race at the track in eight years. Not to be outdone by a former assistant trainer, Pletcher sent out Channel Cat to victory in the 1 5/16-mile, $400,000 Exacta Systems Dueling Grounds Derby. Just one race earlier, Jonathan Thomas, who's been on his own for about a year and a half after working for Pletcher, made his training debut at Kentucky Downs and won the $300,000 Fifth Third Insurance Dueling Grounds Oaks with Osare. The Derby is for 3-year-olds; the Oaks is for 3-year-old fillies. Although each man has one win at the meet, you might say Thomas is one-up on Pletcher. Channel Cat was timed in 2:15.51, about a half-second slower than Osare's time in the Dueling Grounds Oaks. Over the years, Pletcher, a seven-time Eclipse Award winner, has had off-and-on contact with the Franklin, Ky. track. He won the 2009 training title at Kentucky Downs with five wins from eight starts when purses were significantly smaller than they are today; went 1 for 3 in 2010, was away for three years; and won once from three starts in 2014. After another three-year hiatus, Pletcher was victorious in today's Dueling Grounds Derby with his fourth starter of the meet. Channel Cat, the 5-2 second choice ridden by Luis Saez, was never worse than fourth or more than two lengths behind the leader. Cullum Road came from eighth before hooking Channel Cat in upper stretch for a scintillating duel to the wire. New York based-jockey Luis Saez was riding at Kentucky Downs for the first time, winning on Channel Cat in his second mount. Those two finished 3 1/4 lengths ahead of Captivating Moon, who was 1 1/4 length ahead of favored Bandua at the finish line. Cullum Road's connections were to the point. “He ran a good race. I just got beat,” said jockey Tyler Gaffalione. Jailhouse Kitten, early pacesetter Fred'stwirlincandy, Zero Gravity, Reride, Morning Stride and Zanesville rounded out the order of finish. Calumet Farm had both the winner and the beaten favorite in Bandua, who is trained by Irish-based Dermot Weld. 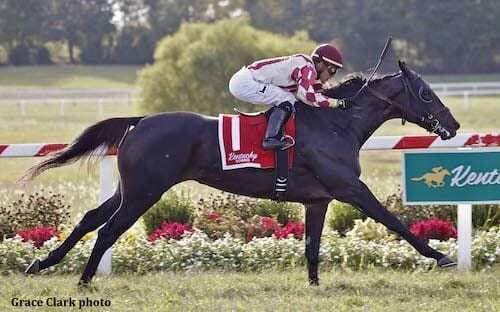 Channel Cat is a son of English Channel, a Breeders' Cup Turf winner and 2007 Eclipse Award champion grass horse. English Channel was also trained by Pletcher and later purchased as a stallion prospect by Simpson County native Brad Kelley's Calumet Farm. Kelley bred English Channel to his mare Carnival Kitten, who is by another champion, Kitten's Joy, the 2004 Eclipse Award champion grass horse. It all meant that Channel Cat was born to go really long on turf, with both English Channel and Kitten's Joy excelling at 1 1/2 miles. “That's why I ran him against older horses last time,” Pletcher said, referring to a second in a Saratoga allowance race at 1 3/8 miles. “I'd been trying to get him stretched out. There are very limited opportunities for 3-year-olds going anything beyond a mile and an eighth on grass. He ran a very respectable fourth in the Belmont Derby, and we always felt that he's the kind who will get better when he gets older. It was Channel Cat's third win from 11 starts with two pair of seconds and thirds. Although the Dueling Grounds Derby was his first stakes win, Channel Cat has seen deep competition recently, finishing fourth in the Grade 1 Belmont Derby in July, third in the Grade 3 Pennine Ridge in June and sixth in the Grade 2 American Turf at Churchill Downs on Kentucky Derby day. With winnings of $235,600 from the victory, Channel Cat has pocketed $431,792 in his career. Jonathan Thomas made his training debut at Kentucky Downs a memorable one on Wednesday, taking the 1 5/16-mile, $300,000 Fifth Third Insurance Dueling Grounds Oaks with front-running Osare easily holding off the late-running Princess Warrior by 2 3/4 lengths. The triumph gave Eclipse Award-winning jockey Jose Ortiz his third win on the card to pull him into what became a three-way tie for the lead of the jockey standings with defending meet titlist Julien Leparoux and Tyler Gaffalione (who won the last race upon a disqualification) at six wins each heading into Thursday's closing card. The leader at each call of the race, Osare and Jose Ortiz, who won for the third time on the day, were in front by about a length throughout the sweeping far turn and extended their advantage in the stretch to prevail by 2 3/4 lengths over hard-running second finisher Princess Warrior, trained by Kenny McPeek and ridden by Brian Hernandez Jr. Bet down to 7-2 from an 8-1 morning line, Osare — which means to dare in Italian — returned her $2 backers $9.80 to win, $5.80 to place and $4.00 to show. The winning time was 2:15.06 over turf rated good. “All we wanted was to not leave her too much to do with the ground being a little tacky,” Thomas said. “Jose gave her a beautiful ride. It was a very positive forward ride. I thought he got her to relax really nicely down the backside and he saved a lot of ground. It was great, the kind of ride you expect from Jose. Thomas, a former assistant to Todd Pletcher, added to a big year highlighted so far with Catholic Boy's wins of the Grade I Belmont Derby Invitational Stakes on turf and Grade 1 Travers Stakes on dirt. In 2018, Thomas has 23 wins from 85 starters, which amounts to an astonishing 27 percent win rate, with a 12 seconds, 12 thirds and purse earnings of $2,440,498. Osare added a nice performance to her already rich pedigree. She's a half-sister to Arrogate, the all-time leader in purses with $17,422,600. Arrogate ranked first by earnings in both 2016 and 2017 and won the Breeders' Cup Classic, Pegasus World Cup Invitational Stakes and Dubai World Cup in successive starts. Bred in Kentucky by Clearsky Farms, Osare is out of the Distorted Humor mare Bubbler, the dam of Arrogate, and was sired by Medaglia d'Oro. Clearsky also bred Arrogate. Winning owner John C. Malone and his Bridlewood Farm's regally-bred 3-year-old filly now has two wins from four starts and $229,080 in earnings after adding the $172,980 winner's share of the Dueling Grounds Oaks to her bankroll in her stakes debut. In fact, training at Bridlewood could have made Osare feel right at home at Kentucky Downs. Osare and favored Pamina dueled down the backstretch before Osare slipped ahead going down the dip in the big turn with initial fractions going in a moderate 25.36 seconds for the first quarter-mile, a half in 51.20 and six furlongs in 1:16.45. Princess Warrior was eighth, but only 2 3/4 lengths off the pace, after the first half-mile and steadily advanced around the bend and down the lane under Hernandez. Sippin Kitten finished third at 21-1 odds for meet-leading trainer Mike Maker, beaten 3 1/4 lengths, after closing from an early 10th-place position. Malibu Saint, in at 55-1 for Maker, finished fourth, another 2 1/4 lengths back, after saving ground through the far turn. Rounding out the field were Rahway, Over Thinking, Pamina, Lemon Princess, Smart Shot, Cloak of Secrecy, Dothraki Sea and Heavenly Love. With only Thursday's card left in the meet, Maker has a virtually insurmountable 8-3 lead over Wesley Ward and Mark Casse. Six-time defending owner Ken and Sarah Ramsey won the fifth race with Peru – and teaming with Maker and Ortiz — to take a 3-2 lead in the owners' standings over DARRS Inc., Calumet Farm and Woodford Racing. 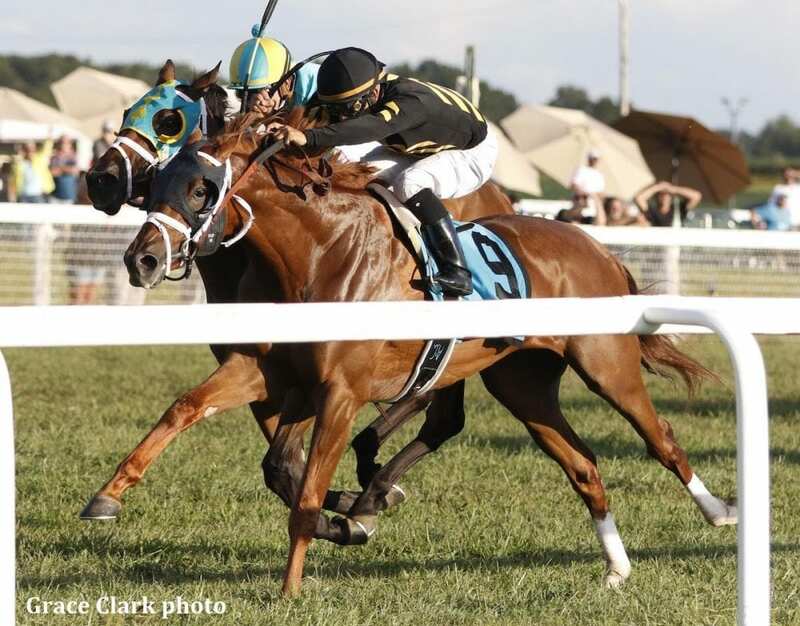 This entry was posted in NL List, Racing and tagged Bridlewood Farm, Calumet Farm, channel cat, dueling grounds derby, dueling grounds oaks, English Channel, Jonathan Thomas, kentucky downs, Luis Saez, medaglia d'oro, osare, ted nicholson, todd pletcher by Jennie Rees. Bookmark the permalink.